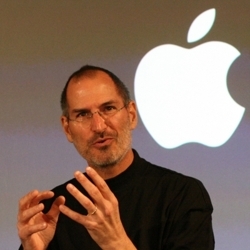 Sony Pictures is in the process of acquiring film rights to Steve Jobs, the upcoming authorized biography by former CNN chairman and Time Magazine managing editor Walter Isaacson. Based on more than forty interviews with Jobs conducted over two years – as well as interviews with more than a hundred family members, friends, adversaries, competitors, and colleagues – Walter Isaacson has written a riveting story of the roller-coaster life and searingly intense personality of a creative entrepreneur whose passion for perfection and ferocious drive revolutionized six industries: personal computers, animated movies, music, phones, tablet computing, and digital publishing. Isaacson’s book was originally scheduled to be released by Simon & Schuster on November 21 but has been moved up nearly a month to October 24. Billed as the only authorized biography, Steve Jobs is based on more than 40 interviews with Jobs in addition to interviews with more than one hundred friends, colleagues, competitors, and family members.